I am loving profiling my models and from my readers responses you are enjoying their stories as well. Lou May was with me for longer than most of my models (and quite frankly looks the same today, what is her secret??? ), I have told many of them they hung up their “dancing” shoes much too early! I have found when I do reunion shows (yes, a posting on that down the line!!) they come show ready and it is as if they have never been off the runway! It is a joy to see. Lou was a chameleon to the nth degree. She could be sporty in one run, sultry in the next and pure glamour in the next. Quite frankly that is what a model should be but not all are. When you book a show you consider the look of the model…sure you can make them all look the same, and I have done that on many, many occasions, but you also need to take into account how they will present the garments they are wearing. They most certainly don’t have to like what they have on but they need the audience to think it is the most fantastic outfit ever! Lou always did that. In 1963 I was working as a stylist for a photographer who did all kinds of photography, including fashion ads. One of the photo models was going to the Marshall Field’s audition for runway models. She asked if I would go with her. I had no plans to actually audition, but when the director of the audition pointed to me and said “You’re next”, I thought “Why not”. I was hired. The first show that they booked me for was the Designer Show. They gave me one outfit. It grew from there to include Saks Fifth Avenue, Carson Pirie Scott, I. Magnin, Lord and Taylor, Wieboldt’s, Montgomery Ward, The Art Institute and many small specialty stores, as well. I feel that I have been most fortunate to have had the opportunity to work with so many intelligent, professional, fun and lovely women, both models and fashion directors. It was a great experience that I treasure. On the catwalk at an Apparel Center Fashion Show. WHAT WAS YOUR FAVORITE SAKS FIFTH AVENUE SHOW (S)? My favorite Saks Fifth Avenue shows were the in-store seminar shows with Nena. What could be better than a lovely setting, beautiful clothes, a small group of friendly models, an informative presentation and a smiling, attentive audience. Modeling was a part of my life for more than 30 years. I enjoyed the big, extravagant shows and tea room shows and all those in between. The peaceful respite provided by the in-store shows certainly was a help and a joy in my life. Nena has an extraordinary talent for orchestrating all kinds of events and I have been privileged to experience many of them. I always looked forward to all of the new collections and never really thought about a favorite designer. Each designer had a very distinct style and personality. I enjoyed the challenge of adjusting to the mood of that individual style. It was also fun to be in the Art Institute student shows produced by Dorothy Fuller. I got to listen to part of the lesson at the fittings. Marcia Anderle was one of the special students who went on to work successfully in the Chicago fashion community. In 1969, Prince Philip came to Chicago and Marshall Field’s was on his itinerary. I was one of three models hired to wear Hardy Amies’ (atelier to the Queen) collection and pose as mannequins in the 28 Shop in case Prince Philip should ask for a fashion show. There was a banquet table sumptuously displayed with an antique silver tea service, silver trays filled with tea cakes, cookies and mini sweet rolls, Wedgwood china and fresh flowers, just in case he requested tea. A server dressed in black with a ruffled apron stood next to the table. We took our places on the appropriate platforms and the Field’s executives arrived to inspect. An argument arose over whether the table cloth should be ironed to remove the creases formed by the folds. It was decided it must be ironed. Chaos followed as we all pitched in to remove everything from the table. Housekeeping raced to iron the table cloth. We were all in fear that the Prince might walk in at any minute. We helped rearrange the display on the table and took our places again. We stood for four hours, not being able to sit in fear of wrinkling our outfits. Prince Philip never left the men’s store in the annex. He never saw all the British displays carefully crafted throughout the main store and, of course, he never got to see those gorgeous live mannequins patiently standing and waiting for him. The very nature of modeling and fashion is seasonal and thus part time. This allowed me the flexibility to pursue real estate and rehabbing. I definitely spent more time in lumber yards and plumbing shops than shopping anywhere else. (Still do!) Combining construction with make-up and high heels in the same day wasn’t always easy. I still have the first building I bought. Thankfully, I married a man who can fix anything and doesn’t care that I am a better plumber than a cook. Modeling has affected my life in many ways. First, I have lots of wonderful memories. Second, I am always on time! Being on time benefits both parties. It shows respect for the other party and you are best served by being prepared in advance. I still think twice when I put myself together for the day, although I am past trendy. I have finally stopped dreaming that I arrive at a show without my bag of shoes. I do confess that I need my slippers to match my bath robe, or co-ordinate at the very least. Nena, I share your love of chandeliers and lighting in general. It has a profound effect on mood and ambiance. I have collected many fixtures throughout my life and incorporate them in my rehabs. Recessed light adds a dimension, but a central chandelier can decorate a room regardless of the furnishings. In Lou May’s foyer, stunning, I want it!!!! At the opening of the Terra Museum of American Art in its first location in Evanston, Illinois. I will do a separate post on this exceptional event. As you can see Lou May is dressed in a modern interpretation of the painting behind her. Photos courtesy of Lou May. Terra Museum photo, photographer credit not available, is part of the Nena Ivon Collection in the Columbia College Chicago Archives. Please be sure to leave comments…and pass the blog information on to all your contacts…I would be most appreciative of your support! From LIFE Magazine photo by David Lees 1960, Pucci in his studio. Emilio Pucci signing his signature print fabric in his workrooms. Emilio Pucci visited the Chicago Saks Fifth Avenue store on several occasions. We always did a formal show for a charity group (most of our shows were to benefit the many worthy organizations in Chicago, over the years we helped raise millions of dollars, who says fashion shows are fluff!!!???) I found Sr. Pucci to be beyond charming, a delight to work with and a great conversationalist. His talent, of course, goes without saying and his creations had a unique look. His clothes were always very wearable, packed like a dream and were totally timeless. I like to think that Adam Gimbel, President of Saks Fifth Avenue, built his famous ski slope in the Fifth Avenue flagship store to honor Pucci (probably not but it sounds good, don’t you agree!!!) They would have been in the same social circles and Mr. Gimbel, one of the most imaginative of the Merchant Princes, was always finding new ways to “market” his illustrious brand as well as highlighting all the major designers, of course that included his wife the incedible Sophie of Saks (I did her profile several weeks ago). That has always been a Saks signature. What I love about the Italian fashion industry (other than its beauty, of course) is that they are dynastic with few exceptions. This is true of the Pucci brand which has been carried on by his daughter, Laudomia. Here I am with an unknown gentleman holding one of my Pucci dresses, proabably early to mid 1960’s. It is shades of yellow and green. It had a matching chiffon scarf, (the dress is silk matte jersey) which I still own. Don’t you love the print against print, oh my! The outfit I have on is from Adolfo’s first ready-to-wear collection. Both the Pucci dress and Adolfo costume, there is a navy wool 3/4 jacket trimmed in the same print, are in the Fashion Study Collection at Columbia College Chicago. Please take note of the curls and the really hateful shoes!!! Was I ever that young!!!! www.colum.edu/academic/fashion-collection. Photo credit unknown. Photo courtesy of the Nena Ivon Collection in the Columbia College Chicago Archives. Emilio Pucci at a fitting of his collection. Photo credit unknown. My favorites were the beaded gowns. This one is delicately embellished at the deep plunge neckline. Photo from lst Dibs. Here an example of an all over beaded gown. Photo credit unknown. Some of the cloth covers of the Pucci limited edition book. A monograph on the designer from a series from Assouline. I am always entranced with other people’s collections, especially when they aren’t in my realm of knowledge. A few years ago, I became fascinated with the collection I am sharing with you today. My friend, Barbara Varro (we became friends many, many years ago when she was in the fashion business as an editor and I was in retail), has a wonderful home in Harbor Country, it is a modern structure filled with many treasures from her extensive travels, various artworks, photos from her trips and with friends, books, etc. and family heirlooms. One of these heirlooms is today’s topic. The base is burnt orange and white with transfers of cottage and garden scenes, two in fact. The cottages look very English with thatched roofs and English flower gardens. They are Czechoslovakian and the pattern is Victoria (is that where the English comes in???) The 15 piece set was given as a wedding gift in 1935 to Stephanie and Edward Czechanski. Stephanie had the set displayed in her kitchen hutch. She later gave the set to Barbara’s mother in the 1950’s who placed them on shelves in her kitchen. They were stored for years and now are proudly displayed once again so everyone can admire their unique look. I am particularly fond of the cruet set…love the shape of it. Here are a couple of the other pieces in more detail. You can see the two images clearly in this shot. We have no idea why the writing is Asian, obviously hand applied and not in a straight line, I think both add to the charm of the pieces. I think the lids look like a pagoda in their shapes. Having searched on line, I didn’t find anything similar. Lots of Victoria brand but totally different patterns. What discoveries have you made when visiting your friend’s homes or in your attic or garage…do share in comments! What an amazing wood pile…. the symmetry is extraordinary. If I had a wood burning fireplace this is how I would store my wood, wouldn’t you!!! Photo credit unknown. I have always loved wood, got that from my Father, I adore wood burning fireplaces, wish I could have one, but since I can’t I like to visit my friends who do and sit as close as I can to enjoy the warmth and the flickering flames. A friend’s wood pile by their backdoor. My photo. In addition, I do love to look at trees especially in the winter when you can see the shapes of the branches and look at all the different colors and textures of the bark. 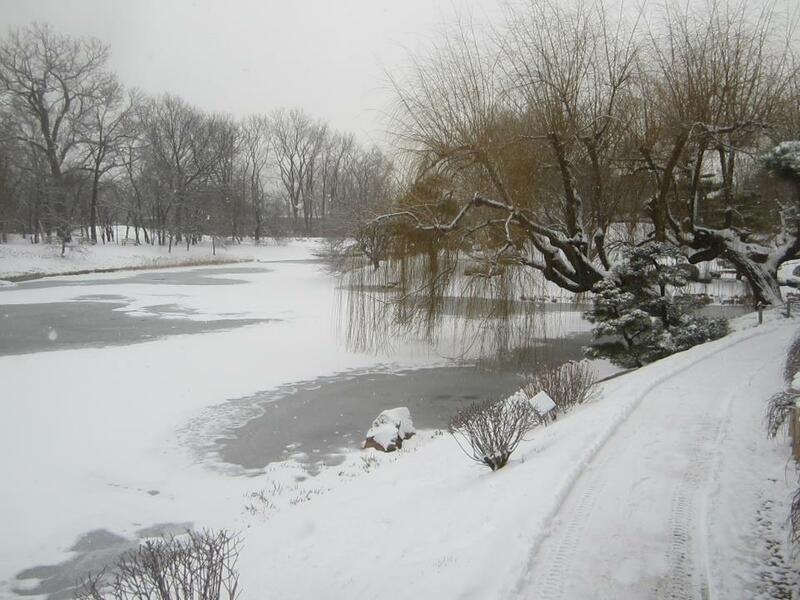 One of the best places to observe this is, of course, our wonderful Chicago Botanic Garden, www.chicagobotanic.org! Chicago Botanic Garden, love seeing my favorite weeping willow tree in winter silhouette. Photo from Chicago Botanic Garden. I took a couple of photos last weekend, when I was in Harbor Country, of bare trees and a bit of falling snow…it was 0º at the time so I shot them from inside the car. I was trying to find birch trees to no avail, saw them while I was on the South Shore train but the windows were too dirty to do them justice!!! Oh well, I shall do them in the near future. Look at frozen Lake Michigan from the Michigan side with the windswept conifer against a truly magnificent blue sky. In one of the walking “parks”, I found this lovely shaped tree against a background of a grove of trees, you can see what I mean about different shapes and shades of gray, brown, taupe, etc. Today’s recipe is from Margaret Buckman’s www.maragetbuckman.com recipe box…it is her specialty, Cheese Souffle, truly a delight, don’t wait for company to serve, do it on a regular basis. All it needs is a green salad and more white wine, beer or champagne, of course! MELT BUTTER IN A SAUCEPAN AND WHISK IN FLOUR WITH A WIRE WHISK. WHEN SLIGHTLY BROWNISH IN COLOR, WHISK IN WARM SKIM MILK. WHISK UNTIL MIXTURE IS THICK WITH THE CONSISTENCY OF CAKE BATTER. IN A MIXER WITH WHISK ATTACHMENT, BEAT 6 EGG WHITES WITH ¼ TSP. CREAM OF TARTAR AND ½ TSP SALT. BEAT UNTIL MEDIUM DRY PEAKS APPEAR. FOLD IN ONE SPATULA OF EGG WHITE MIXTURE TO THE ROUX. FOLD IN THE REST OF THE ROUX IN SMALL BATCHES INTO THE EGG WHITE MIXTURE. POUR THE MIXTURE INTO AN OILED SOUFFLE DISH AND PLACE IN THE OVEN FOR 40 MINUTES IN A PREHEATED 400º OVEN. WHEN THE SOUFFLE IS A GOLDEN BROWN ON TOP, REMOVE FROM THE OVEN AND SERVE IMMEDIATELY WITH YOUR FAVORITE SALAD! It is the BEST cheese souffle you will make or eat…give it a try, don’t be nervous it will turn out just beautifully. I believe I have mentioned that most of my favorite books are historical novels based on real people. It can be any time frame, although I am partial to mid-nineteenth to mid-twentieth century, my favorites are about artists and their muses and/or their wives. One particular favorite was Clara and Mr. Tiffany, loved it! I would give it more than 5 stars for sure. One I read last year (it still seems strange to say that, but it was 2016!) was Oil and Marble. I can’t even tell you how many people I have recommend this book to and all have been as entranced as I was. What I look for in a book, I would like to recommend or to review, would be that I don’t want it to end, I am enjoying it that much! I happen to read very fast quite often finishing a book in a day (sometimes an evening, albeit it is a long evening). When I find one this good I drag it out. I don’t really remember how I heard about it, I read so many book blogs, many of which preview new releases and I put them on my TBR list. The story takes place between 1501 and 1505 (not my normal time frame) when Leonardo di Vinci and Michelangelo both lived and worked in Florence. The premise is what if Leonardo di Vinci, the elder artist, (who has ever matched him in his creativity in so many areas of art, literature and invention, at any age…no one! ), and Michelangelo, the “upstart”, had an imagined competition for a perfect piece of marble and what each would create with it. Actually the “what” is dictated by the men paying for the final piece. It tells the story of Michelangelo’s David as well as the romantic portrait that becomes the Mona Lisa and who she was (?). In the story she becomes Leonardo’s obsession, lucky us when we are able to see her beautiful portrait in the Louve (I first saw her at the Metropolitan Museum of Art in New York when she visited there!). Brilliantly written with a wonderful concept in reimaging the historical aspects of the novel. Storey brings the distant past to reality along with vivid descriptions of the landscape, the artists studios and most importantly the politics of the time (of any time) and how artists, no matter how established, are bound by the demand for perfection. I think you will enjoy this piece of historical fiction. Let me know how you like it. “Stephanie Storey is a writer and art fanatic. She has a degree in Fine Arts from Vanderbilt University and attended a PhD program in Art History—before leaving to get her MFA in Creative Writing from Emerson College. She has studied art in Italy and been on a pilgrimage to see every Michelangelo on display in Europe. When not writing novels and screenplays, she works as a television producer and tries, but fails, to do headstands in yoga. She lives in LA with her husband, an actor and Emmy-winning comedy writer. Oil and Marble is her debut novel.” Taken from the back flap of the book. I am looking forward to her next work. I decided to give my former models a questionnaire much like the one I do with my other profiles. Here is the first of that series. Join me in learning more about Jennifer Wisniewski. Jennifer was always the consummate professional and extraordinarily talented on the runway, doing informal modeling in the Store and working with me on small “trend” shows both in and out of the Store for many years. She was a chameleon, in one outfit the girl next door in the next a siren…here are her recollections of her modeling days. NI: WHEN DID YOU START YOUR MODELING CAREER, WAS THIS SOMETHING YOU ALWAYS WANTED TO DO? One of Jennifer’s model composites. NI: WHAT WAS YOUR FAVORITE SAKS FIFTH AVENUE SHOW (S)? JW: Oscar de la Renta! It was my first show for you ever and I was so petrified of doing a good job and after I ran to the phone and called Eva (my agent) and on the other line was your assistant telling her that you wanted to use me for the rest of the season’s shows. I’ll never forget that day. The finale of an Oscar de la Renta fashion show in the Lobby of Lyric Opera. NI: WHO WAS YOUR FAVORITE DESIGNER AND WHY? JW: Vivienne Westwood: I like how she takes her particular punk sensibility and makes beautiful clothes from it and still remains true to who she is. That’s a fine line to walk and it’s not easy to be authentic to who you are and remain relevant after decades. NI: WHAT WAS YOUR MOST FAVORITE “BEHIND THE SCENES” STORY? After I did a show for Isaac Mizrahi, he lined up to kiss all the girls on the cheek and of course I missed his cheek and gave him a big kiss on the mouth. He wasn’t thrilled! JW: WHAT ARE YOU UP TO NOW AND HOW DID YOU BEGIN YOUR NEW CAREER/PASSION? I own a restaurant called Bread & Wine www.breadandwinechicago.com. I write stories and design t-shirts for my company called Tall Orders www.tallorderschi.com and I am director of operations for a PR firm called Six4 Creative www.six4creative.com. I like to take an idea and make it into reality. That’s what drives me, that and I love to solve problems and boss people around. NI: WHAT DID YOUR MODELING YEARS TEACH YOU THAT YOU ARE USING NOW? JW: You (Nena) taught me how to be a model. How to come prepared, how to wear the clothes and be inspired by them and most of all how to be a professional. You were my mentor and what I learned from you I implement in every aspect of my life today. A couple of runs from the formal in-store launch of Emanuel Emanuel Ungaro Collection. A Donna Karan show in a Bucktown restaurant. Jennifer has given me permission to reprint one of her own blog postings …here it is verbatim!! Interesting how people perceive you….oh well, glad she felt she learned something working with me!!!! You couldn’t be early and you couldn’t be late. Arrival was/is exactly five minutes before call time. You always had to have a makeup hood – which is a piece of fabric that you put over your head to protect the clothes, when you are trying them on. I’ve seen models have complete meltdowns, when they didn’t bring theirs. You couldn’t touch the clothes. At all. If you were chewing gum: you were fucked. Oh, and you had to call her “Ms. Ivon”. Sometimes models would get uppity and called her “Nena”. Not smart. For a fitting (when one tries on clothes, before the runway show), there are probably about 20 girls in the room. You’re totally naked (a nena note, not totally naked at least not at my fittings! ), very thin, and standing in silence, while you wait to be yelled at (a nena note, I don’t remember “yelling” at my models) for doing something wrong. I don’t remember those five seconds I was on stage. I do, however, remember being scared to death of her. But, I liked her – I liked and respected her. Now I completely understand why she was the way she was. Experience carves a person – and she simply realized that if she didn’t run the models—they would run her! Jennifer in a St. John evening piece at a formal runway show at a sit-down luncheon in store. I loved to watch her. She would walk in a room and people would stand at attention. The thing about modeling that no one ever talks about, is that it takes real discipline to do it everyday – and she taught me that. It’s an art, but it’s also like being an athlete. There is a conditioning and a competitiveness to it. Nonetheless, Nena gave me my first break. She was the reason I worked every day. I remember when Oscar de la Renta was in town and he booked me for his show. After I got off the runway, I went to a payphone (yep!) and called my booker to tell her it went well. On the other line with her, was Ms. Ivon. She said – and I quote, because I’ll never forget it: “You can’t take your eyes off Jenny, when she’s on the runway. I want to hire her for everything.” After that phone call, I began working for her (and everyone else) for the next ten years. Thanks so much, Jennifer, for a glimpse into your thoughts about your modeling career. I hope all my readers will stock up on your super t-shirts and dine in your fantastic restaurant, I know I will! Jennifer has also been kind to share one of her favorite go-to recipes….enjoy!!! lots of lettuce. I like arugula but you can use anything. Simmer the potatoes, green beans until al dente and the eggs for 3-5 minutes. Toss the greens and red onions with the dressing and place the tuna, green beans, tomatoes, potatoes and sliced eggs on top. Season with salt and pepper to taste! Of course served with a cocktail, glass or two of wine or champagne and Jennifer’s infectious smile!!!! Romain de Tirtoff (23 November 1892 – 21 April 1990) was a Russian-born artist and designer known by the pseudonym, Erté, from the French pronunciation of his initials. I had the amazing experience of working with the legendary Erté on two occasions. Both were tied into launches of his new works. The first was in 1974, it was the year that Saks Fifth Avenue (Corporate) was celebrating the 50th anniversary of the store’s opening in New York (the store opened on Fifth Avenue on September 15, 1924) and the Chicago store was celebrating this special event with an elaborate cocktail party. Designers had been asked to do special Art Deco inspired garments which we used in our Michigan Avenue windows as well as on models for the event. At the same time, Erté was launching his jewelry collection at the Circle Gallery in the Chicago Marriott Hotel on Michigan Avenue and I was asked to have models dressed in Art Deco garments do informal modeling for this cocktail party…what a perfect tie-in! One of his art pieces featured a gown with a beaded cobweb for a sleeve. We had a similar piece in our collection and I thought it would be amusing to feature it. How presumptuous of me….here I was with a group of models gowned in Art Deco inspired garments and one inspired by the master himself!!!! As I remember it, I held back on sending out the model in the “spider web” gown but finally did…he LOVED it and thought it was very clever! My reputation was saved!!!! The second was in 1981 to celebrate his 89th birthday at a champagne reception at the Circle Gallery followed by a ball. I co-chaired (I was asked to be involved because of the successful first event I did with Erté) the evening with Jo Hopkins Deutsch for the Fashion Group International of Chicago. There was a student Erté fashion design competition and the winners were presented their awards by this famed creator! This exhibition featured a retrospective of all his work. Guests were encouraged to wear Erté inspired dress or black tie. It was a very dramatic exciting evening. The piece you see below was given to the guests, Jo’s and mine were personally signed by Erté. Unfortunately, the writing has faded with time but says “To Nena Ivon with many thanks for a wonderful evening” with his signature! A true treasure of mine. The original Top Hats as pictured on the cover of Harper’s Bazaar can you spot all the differences? Front of the invitation to the Fashion Group event. My other serigraph, La Traviata, was given to me by my Mother in 1982. I don’t remember the occasion, but it is my favorite opera. Both these posters were hanging in my office at Saks and now live in my friends, Tom Hawley and Tom Mantel’s, home along with their Erté‘s, see the photo below. Two spectacular pieces flanking a magnificent Erté bronze. “Kings Favorite” bronze with painted enamel face and silver leaf on the gown. Isn’t she glorious!!! To have been able to work with this iconic creator was obviously a once (no, a twice) in a lifetime experience. Imagine being able to talk with an artist without equal in the world of fashion…a man who created more than 200 covers for Harper’s Bazaar, started his career with Paul Poiret (it has been debated that it was Erté, not Poiret, who created the now famous “lampshade” silhouette), designed for the Follies Bergère and the Ziegfeld Follies, for film, as well as dressing many of the celebrities of the time and to have created for most of the 20th century…I am truly a very lucky gal! A Harper’s Bazar cover before the name change to Bazaar! Costumes for the Follies Bergère. There are many books on Erté including his autobiography,. I have found the biographies written by Charles Spencer to be the most definitive. My collection of Erté and other books on Russian designers and clothing…the one in Russian I got in Moscow, can’t read it but the pictures tell the story well. The Jacqueline Onassis edited In The Russian Style was the companion book for the Met’s/Vreeland Russian costume exhibition which was extraordinary! Looks like I need to add to my collection and this is only a sampling! He was a total joy to work with, very debonair, very French and, of course, without equal in creativity. ***I meant to include a note on a film I wanted to recommend yesterday in my posting on malachite. The film is The Russian Arc, it was filmed with one camera in the Hermitage. I find it fascinating, others find it quite strange…to each his own! Give it a try and let me know your thoughts, which I always welcome on each of my postings. Thanks for coming along with my wanderings through nenasnotes! By now you know I am obsessed with the color green, it would, therefore, be logical that I would collect objects in green. Since I have made this week a celebration of Russian (and Greek) Orthodox Christmas, which is this Saturday, January 7th, I wanted to continue the theme with a discussion of my small malachite collection. I visited Russia in 2002 and had the opportunity to spend a week in Moscow and a week in St. Petersburg. It was an amazing trip and I will discuss my impressions of the Cities in another post, today I wanted to concentrate on this interesting mineral. I did get a couple of malachite objects there but I purchased more amber than malachite, again another story. I just learned that this mineral is special to Libra’s. Most certainly a fact I didn’t know… lucky me, I’m a Libra! It is said that malachite is a healing stone. Here a cross section of the mineral. The Malachite Room in the Winter Palace (The Hermitage). I want these doors, can you even imagine????? They were magnificent, to say the least. A malachite mantle in the Hermitage in St. Petersburg. The green paint on the walls is almost the same as my walls….who knew!!! Close up of my faux malachite mantle, made especially for me by my dear friend, the incredibly talented, Mark Heister, with its gold embellishment. I featured the entire fireplace in my mantel posting several weeks ago. In 2005 we had a very special visitor at Saks Fifth Avenue, Chicago, Tatiana Fabergé who brought her incredible collection of objects to us, it was the first time since 1917 that new Fabergé was available. I was overwhelmed with the beauty of the pieces and to be able to own a Fabergé was beyond belief and to have it signed by Tatiana Fabergé, words escape me. I purchased two items for myself, a green enamel egg and a malachite and gilt frame. She was kind and signed both for me. I did purchase a couple of eggs to give as gifts. Tatiana Fabergé, great-great-granddaughter of Gustav Fabergé, founder of the company, whose son was Carl Fabergé. A photo of my Father in my signed Fabergé malachite and gilt frame. He is wearing a favorite Hawaiian shirt all the rage in the late 1940’s, seriously!!! The Czar in a Fabergé malachite frame, in the Hermitage malachite room, notice the attached stand, it is the same on my frame! My small collection of malachite items….the necklaces, along with large ball drop earrings, were purchased in Moscow as was the charming watercolor of Saint Basil’s Cathedral, in its own malachite and gilt frame. The needlepoint pillow is from Jonathan Adler. Time for our weekly recipe….this one is kindly shared by Tom Hawley from his Mother, Elenor’s, recipe box. I can attest to the fact that is is absolutely delicious and very easy to make. We used leftover beef from a standing rib roast, unbelievably delicious!!! Use a good piece of beef don’t use tenderloin it is too lean….you do need a bit of fat Since this was already cooked we only browned it and cooked with the other ingredients for about 20 minutes or until the mushrooms were tender. If using raw meat cook for about 40-45 minutes after browning. Our meal was served with glazed carrots, followed by a green salad lightly dressed with a vinaigrette and a rich dessert. Of course, lots of wine, this time we did a bold red but since is it a Russian dish why not more champagne! Here we are in a brand new year…can’t even imagine how that happened but it has and we all reflect on where we are, where we have been and where we are going. I was asked, several years ago, to write an article about what I thought “fashion” in Chicago was all about. Being a native Chicagoan I resent that our moniker “Second City” is used in a negative way…it means it is Chicago’s brand new city after the Great Fire not that we are second to any other city! I do realize that I am a voice in the wind but it really annoys me! I am sharing my thoughts on how our fashionable citizens choose their style and more importantly, maintain their elegance by being individuals! Second City, I think not….remember our name contains the word Chic!!!!! We don’t use hay in our hair as accessories…we prefer wonderful fascinators. Chicago’s fashion savvy are very aware where to find the best of the season and how to put it together with panache. Perhaps they depend on that special secret sales associate to assure them that they won’t appear in the same dress their best friend has chosen or work with their stylist (a term that needs more definition, does everyone think they are a “stylist” maybe…but really….). They know a good sales associate and fitter are key to their shopping experience, it is magical to have that perfect relationship! Even the most seasoned shopper welcomes positive reinforcement and creative suggestions to add to their closets, therefore avoiding mistakes by impulse buying. Who among us hasn’t done that, just think of all the “on sale” things that end up on the top shelf of the closet or under the bed, never worn? On the other hand buying on sale, something that works with your already established items can be the smart thing to do. They might shop pre-season when ALL the International designer trunk shows come right after their debuts from around the world (including our fashion forward local creators). Or they might wait until early receipts come into the vast variety of stores Chicago has to offer. They can pick from Designer’s Boutiques (aren’t we lucky to have all the best of the best with more coming, this seems to be a weekly occurrence!) to Ikram, to Saks Fifth Avenue (perhaps I am partial to that retailer since I spent my entire retail career there!!!) to Neiman Marcus to Barney’s…the list is endless. I can think of many of our superbly dressed (no, I’m not mentioning names, they know who they are and so do you, you read Candid Candace, the many local blogs, Michigan Avenue and CS for pity sake!!) who used to wear a designer label head to toe, in my opinion that isn’t the modern approach, mixing designers, prices, high with low and low with high, is the way to go and our CHICagoans seem to be doing just that. Where else can you spend days in three vertical malls on Michigan Avenue or countless hours in neighborhood boutiques or even find the season’s dream outfits at H&M or Zara. The fashion self-assured photograph their wardrobe along with chosen accessories, label their shoe boxes and categorize their accessories for easy access. They dress in a comfortable way, do not think for a minute I mean messy…if they wear jeans and a t-shirt they are designer labels, defining their individual style with their choices. I don’t feel our fashion intelligentsia has to scream “look at me I am wearing an entirely new outfit head to toe” but rather “look at me I am a smart shopper who is in tune with herself and can pick what are the newest items to add to my already established wardrobe”. They are indifferent to fleeting fashion trends unless those trends can work with their other choices and their lifestyle. Our fashionista is cool, calm, confident, classic, current…she (or he!) knows what works for them and has the confidence to carry off their own brand, themselves!! Second City, nonsense!!! Submitted, several years ago, to Michigan Avenue, never published. Updated here.